This week we have a Dark Universe rises from the dead?, Nasa and Uber usher in the age of flying taxis, 80's cartoons, Lord of the Rings drama, more Star Trek maybe, Vampire Chronicles loses Fuller, Daredevil S3 news, The Predator, Clue remake, Batwoman comes to the Berlantiverse and more! After last year’s bomb, The Mummy, the idea of the Universal studios shared universe (Dark Universe) looked to be shelved. But now rumors are circulating that it may be alive in one form or another. An artist who worked with the Dark Universe team recently said that he won’t give details but he’s ‘stoked’ about the project. I didn’t bother with The Mummy because it was panned, but the classic monsters (Wolfman, Dracula, the Mummy, Frankenstein, Creature from the Black Lagoon) all sharing a universe could be kinda neat. So it comes as a welcome bit of future focused news that NASA and Uber are now collaborating to make flying to your destination a reality. We’re not talking about a plane trip (well not exactly), not to another city. No, this is air taxis. Short range air travel within an urban environment. Called the UAM (Urban Air Mobility) initiative, the aim is to figure out the logistics of this kind of travel, using small planes that could potentially run entirely on electricity. If this works out we could be have tiny planes crisscrossing our skies in the near future, and your Uber trip home after a night of partying might be a lot more exciting. 80’s nostalgia has kind of waned recently, but that hasn’t stopped Cartoon Network or Netflix, who are producing remakes of two iconic and beloved 80’s cartoons. First, Cartoon Network is looking to reboot Thundercats (which will mark the second time the network has rebooted the series) as a more cartoonish version of the cartoon about heroic alien cat people (the other reboot was more adult in both themes and animation and was cancelled after one season). Meanwhile, She-Ra, originally a spin-off of He-Man, is being remade on Netflix and animated by Dreamworks. I never watched an episode of She-Ra but I must admit I’m more intrigued by that show than the Thundercats remake, which looks awful. I’ve heard a lot of rumors about the massive Lord of the Rings adaptation that is being produced on Amazon, from the wild costs, and even wilder casting rumors (Ian McKellen has said he would like to reprise Gandalf even though this is supposedly a totally unrelated project). Even Peter Jackson has been rumored to be at least in collaboration. Now it looks like the series will focus on a young Aragorn during the time between The Hobbit and Lord of the Rings. While this is relatively uncharted territory, and more interesting than a straight remake of the movies, I’m wondering why they are going in this direction. Amazon has stated they are committed to producing at least five seasons of this series, so we’re going to be getting a lot of it, no matter what. I’ve reported this one before, but the Anne Rice produced Vampire Chronicles TV series has hit a minor speed bump as Bryan Fuller departs the project. This is not the first time Fuller has left a production early on like this. He also left Star Trek Discovery, American Gods, and Amazing Stories. When something like this keeps happening it is clearly a pattern, one that I imagine will give him issues in the future as studios fearing he will do the same to their project won’t be inclined to hire him. Chris Rice (the show runner) has said that the project is still moving forward. There hasn’t been a lot of information about the upcoming season of Daredevil, but news has just hit that we may have a central villain. Wilson Bethel has been listed as a cast member for a while now, but recent rumors have speculated that he isn’t going to be "FBI agent Steve" as it lists him in the official casting, but instead is going to be the mercenary Bullseye. The character was last adapted for the screen in the much maligned (2003) Daredevil movie starring Ben Affleck. This could be an interesting move, with Bullseye being one of Daredevil's oldest and most difficult foes. Marvel has gotten a lot of criticism about the occasionally wonky tone they use with their movies. Super serious scenes are often undercut with jokes. Shane Black (Iron Man 3) probably caused the most controversy with his choices regarding the villain Mandarin. Now he is writing/directing the latest entry in the Predator franchise (creatively called The Predator). Personally I like his work, and he has gone on record saying that the tone of this film will ultimately be a thriller (not horror or the pseudo-war movie that the first film was), with his trademark humor mixed in as well. Rhett Reese and Paul Wernick (Deadpool) have been attached to the upcoming remake/sequel to the classic board game movie adaptation Clue. The original film is unique, it had an amazing cast and a somewhat bizarre story structure which included multiple endings. The new movie will try to do its own thing and not be a rehash, but remain somewhat tonally faithful to the original movie. It could also be R-rated, which would be interesting but perhaps a little odd given it’s a board game adaptation. The Berlantiverse is getting two amazing new additions next year in the form of Gotham City and Batwoman. They will be introduced in the crossover event (which usually airs in November). Last year’s crossover event was amazing, and some of the best episodes of all four shows. Adding Gotham feels substantive, and I hope it leads to more stories in that city (perhaps even a spin-off starring Batwoman). For those who haven’t heard of the character, she is one of the more important comic characters of recent years, and one of the highest profile gay characters in the DC comics lineup. The long awaited movie finale of Sense8 is just around the corner, and here's the trailer for it. Deadpool 2 - The sequel to the R-rated meta-comedy superhero film Deadpool. Starring much of the same cast, plus Josh Brolin (Avengers: Infinity War) as Cable, a time traveling badass. Book Club - Comedy with a ridiculously great all-star cast (Diane Keaton, Jane Fonda, Candice Bergen, Mary Steenburgen, Andy Garcia, Craig T. Nelson, Don Johnson, Alicia Silverstone, Richard Dreyfuss, Ed Begley Jr. and Wallace Shawn) about a book club that reads Fifty Shades of Grey and is changed forever. Show Dogs - Will Arnett comedy about a dog that has to go undercover at a dog show to stop a disaster. The reviews are already saying this is as bad as it sounds. Oh, and this is live action, not animation. On Chesil Beach - Adaptation of a book of the same name written by Ian McEwan, this stars Saoirse Ronan and is about a newlywed couple from wildly different backgrounds trying to resolve intimacy issues. Pope Francis: A Man of His Word - Biography of Pope Francis as he travels the world. First Reformed - Ethan Hawke and Amanda Seyfried star in this character driven thriller about a grieving former Military Chaplin trying to council a couple. Batwoman, huh? I didn't know anything about Batwoman. Sounds like an interesting possible addition to the Berlantiverse, which honestly, isn't having a great season. Except maybe for Legends of Tomorrow. Sense8! Really looking forward to it, although it's sad that we won't get more. What's up with Bryan Fuller? Geez. Interesting read, J.D. -- thanks so much. I have very vague memories of watching She-Ra (and He-Man), but if this reboot ends up being as good as Dreamworks' Voltron update I might give it a go. 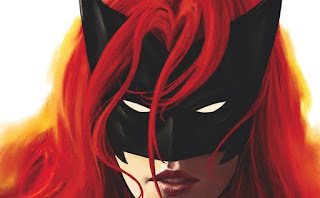 As happy as I am to see that we're finally getting a live action Batwoman, I wish it wasn't in the dumpster fire that the Berlantiverse has become. In regards to Fuller, anyone was gong to have a hard time adapting one of Anne Rice's works. She is..opinionated, and so is he. Am hoping for Hannibal s4. I can dream can't I? Batwoman is one gorgeous looking comic. Hey she dates Maggie Sawyer in the comics. Hmm..